Image credit: Lena @ theheartofgold on Tumblr. I urge you at any point before watching Mr Robot NOT to read anything about it. The world is rife with spoilers and this is one show you want to be shocked by. Real hands-clasped-on-face shock. Real screeching-at-the-screen shock. Real gentle-sobbing-and-rocking-back-and-forth shock. Honestly, look nothing up. Even cast lists will screw you over. I was first introduced to Mr Robot back in the summer by my boyfriend, and we watched an episode together. Now I'll tell you this: that entire night when I was asleep in bed, I dreamt about that show. I couldn't stop thinking about that show. My brain was happily living in the world of that show, to the point at which I didn't watch the second episode until maybe a month later because I didn't want it to ruin this vision I had in my head of what was going to happen. That's when you know a show has totally got you hooked. By the time I got to episode three, I had reached the point of 'I need to watch this, and I need to watch this now', and by 2am I had watched all but the final episode. I decided it was best to leave that until I had fully-functioning mental capacities after sleeping through the night. The next morning (or the same morning if you're being picky), I woke up and immediately watched the finale. It ended, I cried, all I could do was Google the show for the rest of the day, week, month, year. No exaggeration. Mr Robot is my favourite television show of the year, and potentially of all time, and today is the day I force you to watch it. Our protagonist is Elliot Alderson, played by the ever-wonderful Rami Malek. He suffers from social anxiety, clinical depression, and delusions, which he attempts to combat through drug abuse. He quietly works at a cybersecurity company, spending his free time side hustling as a hacker. 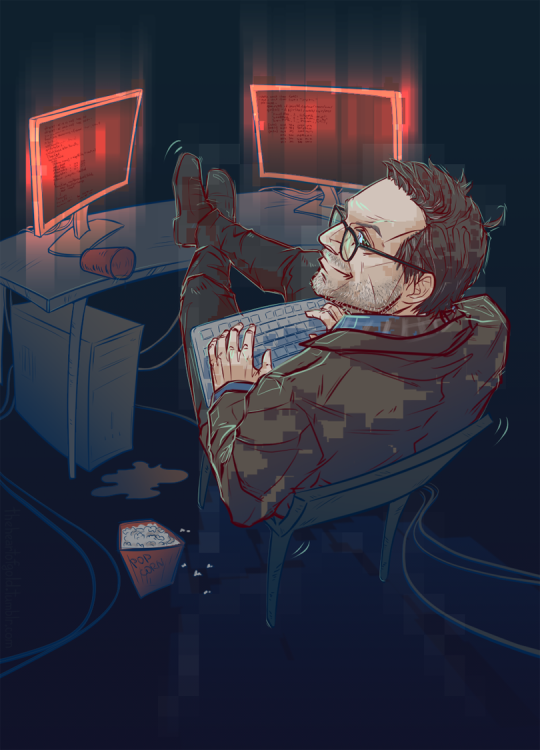 After a huge, complicated hack affects the company he works for, he is brought face-to-face with 'fsociety', an underground hacking group, and their mysterious leader 'Mr Robot' (played by Christian Slater, see image) who invites him to join their ranks in an attempt to bring down, basically, the whole of society to start fresh. That's the basic foundation of our story, but bring onto that Eliot's own personal demons, the grating nature of Mr Robot, the introduction of the troubled characters around him, as well as the big wigs at the top plotting their way to greatness. A lot of interesting relationship dynamics are produced by this dangerous mixture of storylines, and I never found myself bored of what was happening on screen. One of the most wonderful things about Mr Robot is the diversity and inclusivity of its cast. In 'fsociety' was have Eliot (an Egyptian-American male), Mr Robot himself, Romero (a black American male), Trenton (an Iranian-American woman, also the girl in the 'Turn Down for What' video), Darlene, and Mobley (an Asian-American male). Later in the series we meet an important character to the progression of the plot who is a transgender woman. One main character is a gay man, and another is seen conducting relationships with both women and men. I really can't think of a show off the top of my head that deals so well with diversity without showing off that it is diverse. This mix of people, like in the real world, is completely normal, and that's how it should be. This is pretty much all I can say about Mr Robot without giving the good stuff away; I do wish I could say more and gush to you all day about how much I adore it. Just settle yourself down with the first episode and allow yourself to become immersed. Everyone who I've spoken to about the show has loved it (imagine my face when I discovered two whole people at work who had watched it also) and gulped it down in a handful of sittings. You can watch Mr Robot instantly on Amazon Prime if you're in the UK. You probably should.